I set up my Note 7 this morning after receiving it, and I have had the following notification on there since. I even factory reset the device twice and it is still there. Does anyone else have this going on? Are you restoring after the reset? I reset without putting any of my information in and it still showed up. This was not on my S7 edge that I had. T-Mobile. Guess I should've mentioned that earlier. I'm having a hell of a time trying to find the video call forwarding. Try entering ##21# then hit the call button. This will turn off unconditional call forward. Not sure if it will turn off the video but it's worth a shot. 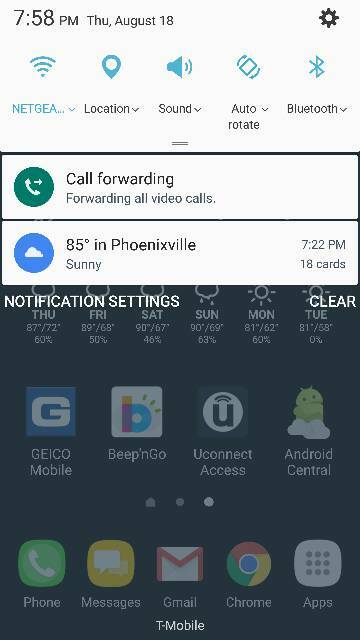 If searched everywhere, but I have no clue to how they enable and disable video call forwarding. You may need to call them and let them know they have video call forwarding provisioned in the switch and to disable it. Turns out after going through T-Mobile tech support and also Samsung tech support, I decided to try a new SIM card - the store manager at T-Mobile said he doubted that was the issue. I figured it was worth a try and sure enough, the issue is gone. Something must have happened to that SIM seeing as it has been in and out of different phones. Why does my mic sometimes not work on calls? Why does my screen go black when on a phone call and need to push speaker or numbers? why did text message notification alerts stop? Can a Samsung Gear Fit 2 accept calls?